The architectural device of having a window or “light” above a doorway to allow light into an otherwise gloomy hall or passageway became popular in the early 18th century. The fanlight became so successful during the Georgian period that it is iconic of the architectural style, forming the focal point and showpiece of the house frontage. It was widely used and can be found in London, Edinburgh, Dublin, Liverpool, Bristol and all the Georgian towns, even spreading to North America, and "colonial" architecture in South Africa and Australia. Initially the windows were rectangular and were simply subdivided with wooden glazing bars, using the same joinery techniques and materials as in sash and case windows. It was perhaps the advent of Palladianism and its arched doorways that created the semicircular form that we now know as a Fanlight. This already aesthetic shape was taken as a design opportunity which reached its decorative peak at the end of the century. The published designs of Robert Adam in the 1770s had a big influence on the development of this decorative form. The technical advances in metal casting resulted in the frames being made of cast iron and later lead , zinc and copper. Highly decorative elements were sometimes cast in bronze. This facilitated a fineness of construction and design that is unique to this neoclassical period. One of the principal manufacturers was the Carron Ironworks, of which John Adam was a Director. 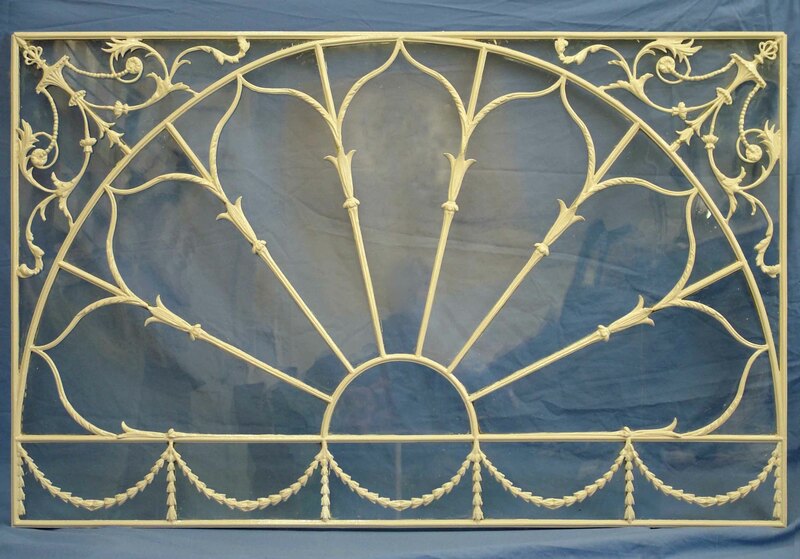 They produced many pieces to the designs of the Adam brothers, including register, hob and dog grates, railings, balconies, foot scrapers and fanlights etc. In the 18th century the glazing was done with “crown” glass. This was made by spinning out a large disc of glass in front of a furnace, a highly skilled process that very few can do today and consequently no longer commercially available to the standard and thinness achieved in the 18th Century. It is identifiable by lines on the surface of the glass that follow the concentric circles of the original glass disc. Because this was never particularly large, glass panes were quite small, hence Georgian windows required a lot of glazing bars. In the 19th century a new technique was developed whereby a large sausage of glass was blown, the ends cut off, the sausage slit down one side and heated so that it unfolded into a flat sheet. This achieved larger panes although some glazing bars were still required. This glass has no radial lines but is still full of minor imperfections and sometimes small air bubbles. Both these types of glass when fitted give a changing reflectivity and a play of light so integral to the beauty of a Georgian building . Today many of the remaining examples, aside from the natural ravages of time and war time bombing, have lost their definition under many layers of paint. At Thistle & Rose the fanlights are carefully and meticulously stripped, missing pieces recast and refitted, missing panes replaced with antique glass and the frame painted to top coat, before refitting. We also supply bespoke orders.